Algory - The largest Crypto Whitepaper Database! Algory’s Cryptocurrency news aggregator positions itself as the quickest and most advanced News Streamer in the Cryptocurrency Industry. Created for traders who need to be fast and need an easy tool to monitor thousands of sources in one place, with an amazing workspace for delivering powerful market insights. When accessing the tool you immediately know it’s an advanced app to access cryptonews. A sleek design with lots of filtering options and customization options. What are the filter options? What definitely sets Algory apart from other news aggregators is the amount of sources you can filter on. Almost 250 websites, more than 10 news types and a ton of Reddit, Youtube and Twitter accounts. Some of the news types are especially cool & innovative, such as filters for Influencers & Airdrops. The good thing is, that you can also turn off some filters, so if you’re not interested in ICO news you can just turn of that filter. Apart from that, you can also filter on certain languages, so you can solely focus on the news in that language. What other cool tricks do they have? One of the coolest things is that you can create your own workspace. You can set up your own little dashboard with your preferred filters. Apart from the crazy amount of filters they also have a beta version of a Cryptoscanner available. 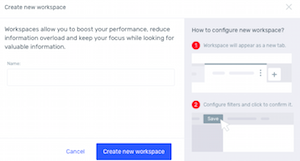 This looks as sleek as the newsaggregation tool and definitely something to keep an eye on. 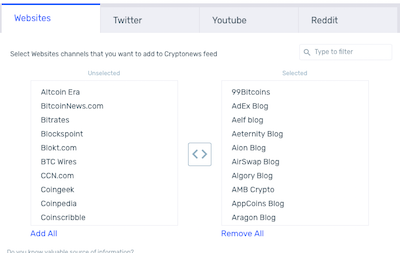 Since the filter-options are so immense, you can use this as your #1 source for cryptonews. Algory is a powerful and multifunctional tool for cryptocurrency trading. You don’t need to keep track of other mediums, such as twitter, youtube and reddit, but you can just go here and read up on all the latest cryptonews! The cool design & customization options make this our favorite crypto news source.